The moment Su Jianping heard the news on July 7th that Hoh Xil in China’s western Qinghai Province had been successfully listed as a UNESCO world natural heritage site, the professor at the Northwest Institute of Plateau Biology (NWIPB)under the Chinese Academy of Sciences felt relief. “Indeed, through previous feedback from the IUCN [International Union for Conservation of Nature] experts during and after their visits to Hoh Xil and their reflections on our application materials, we had already learned that it was overqualified according to two major criteria for the nomination: superlative natural phenomena or areas of exceptional natural beauty and esthetic importance; a most important natural habitat for conservation of biological diversity, in particular, the endangered species of Tibetan antelope,” Su, who participated the preparation work for the bid, told NewsChina at his office in Xi’ning this August. He thinks that compared with other world heritage sites already designated in China, the whole process for the Hoh Xil bid has been the fastest in preparation, the cheapest in cost, toughest in working environments, and had the least scientific data available at the start of the process. Despite all these obstacles, after less than two years of preparation, Hoh Xil was granted the title. Hoh Xil is a Mongolian term meaning “Blue Ridge.” The area is made up of two neighboring parts: the 45,000 square kilometer Hoh Xil nature reserve and the 32,000 square kilometer Soja-Qumar sub-zone of the Sangjiangyuan (Source of Three Rivers) Nature Reserve. This whole region is located at an average elevation of 4,600 meters. It enjoys China’s largest area of uninhabited land and is home to more than 74 species of vertebrates, 20 of which are under State protection, including the Tibetan antelope, wild yak, wild donkey, white-lipped deer, argali sheep and brown bear. There are a total of some 210 plant species, 72 being native to the Qinghai-Tibet plateau. The Tibetan antelope, or chiru, once an endangered species on the IUCN Redlist, lives on the Qinghai-Tibet Plateau at an altitude of 3,250 to 5,500 meters. The species has been intensively hunted for its underfur to make extravagant shahtoosh (ibex wool) shawls, particularly during the 1980s and 1990s. This hunting even escalated to a commercial scale, and according to official estimates, about 20,000 Tibetan antelopes were hunted annually in those decades. Numbers and distribution of chiru have decreased sharply. The total number of the species dropped from 200,000 to 20,000 within a decade. Things started to change as Sonam Dhargye, a local county official in Zhidoi in Qinghai Province witnessed with his own eyes the brutality of the massacre of this vulnerable species and started to voluntarily engage in anti-poaching confrontations with the poachers in the early 1990s. Sonam Dhargye set up a small team of a few fellow Tibetans called the Wild Yak Brigade to protect the wildlife in their home region. The team successfully caught poachers red-handed a number of times during their patrols in the vast pastureland. It was on January 18, 1994, when he and his fellow team of rangers encountered a group of 20 poachers and confiscated seven vehicles carrying some 1,800 hides. Tragically, Sonam Dhargye was killed during a shootout with the poachers. His death was the trigger of a subsequent nationwide campaign against the illegal poaching of the species. A protection station designated to Sonam Dhargye was set up in 1996 in Hoh Xil, two years after his death. Then in 1997, Hoh Xil National Nature Reserve was formally established by the government. The Chinese government honored him as a national environmental guardian, and his story was adapted into a feature film and broadcast nationwide. His actions have had a ripple effect and roused ongoing volunteer environmentalists to devote their efforts to the preservation of the wildlife and ecosystem of the Qinghai-Tibet Plateau. Tashi Dorje, an ethnic Tibetan and an assistant to the late Sonam Dhargye, continued the anti-poaching initiative of the Wild Yak Brigade, and also set up a local environmental NGO in the late 1990s. The NGO was officially registered as Snowland Great Rivers Environmental Protection Association (SGREPA) in 2004. Since then, Tashi has launched various community-based preservation initiatives. (See “Eco-migration: Land of Hope,” NewsChina, May 2013 Issue) Indeed, as more official emphasis is now put into biodiversity preservation and environmental protection, over 1,000 rangers have been hired to patrol the surrounding pastureland near their dwellings in the Soja-Qumar sub-zone of the Sangjiangyuan nature reserve. Communities across the whole region are becoming more active. Successful adherence to the anti-poaching initiative by both the government and the local community has allowed the numbers of the species to revive remarkably. 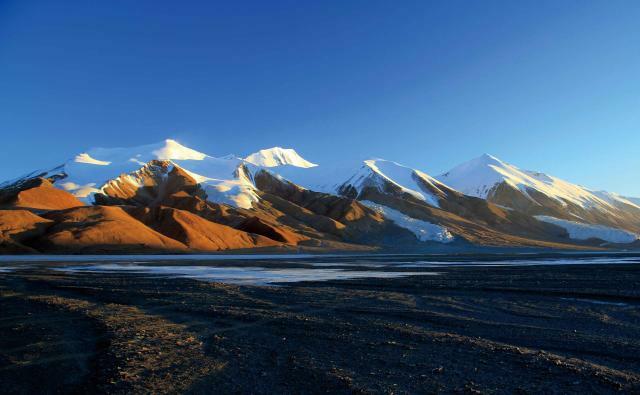 In the Hoh Xil National Nature Reserve alone, numbers rose from 20,000 to 70,000 over the past two decades. Bu Zhou, Hoh Xil administration chief, told our reporter in August that since 2006, no illegal poaching has taken place in the domain of Hoh Xil. As various sources confirmed to our reporter, the decision to bid for world heritage status was made in late 2014 by the Qinghai provincial government. However, the real work did not start until May 2015 when the coordination group was set up. Qinghai’s Department of Housing and Urban-Rural Development was designated as the chief coordinator of the different sections, including institutes studying wildlife and plantlife, animal husbandry, and geological and hydro characteristics within the region. The materials compiled by different groups were presented to an expert team at Peking University led by Professor Lü Zhi, who has been conducting studies on the snow leopard in Qinghai for years. The team from Peking University then drafted the final proposal for the bid. The report on Hoh Xil’s biodiversity resources was prepared by a team of scientists from the NWIPB, located in Xi’ning, the capital of Qinghai. Professor Su, as the leading scientist in the team, has studied Tibetan antelope since 2002. Su admitted during the interview that scientific studies in the Hoh Xil area remain quite insufficient. According to Su, proper scientific research and study in Hoh Xil started in 1990, and a scientific expedition team of over 60 scientists from different fields joined a group expedition that year. “Yet they could only make a three-month tour from May through August due to bad road conditions, and following that, some sporadic individual studies were made over the following two decades,” said Su, adding: “The existing scientific materials remained insufficient for us to present a holistic report.” Considering this, Su and his team had to conduct intensive expeditions from 2015 to early 2017 to gather additional ground data and learn more about the biodiversity of the region. “The draft text of the bid was completed by the end of 2016, since Hoh Xil needed to compete against a couple of other candidates domestically first,” Professor Lü Zhi told The Paper in August 2017. “The unique value of Hoh Xil is irreplaceable. Considering there is no World Heritage natural site on the whole Qinghai-Tibet Plateau and considering China so far has no such wilderness element among its many existing heritage sites, Hoh Xil stands out among its domestic competitors,” commented Lü Zhi to The Paper. In late October and early November, 2016, two experts from IUCN, the official advisory body on natural world heritage to UNESCO, spent over a week in Hoh Xil to inspect the situation of the overall nominated property for assessment of the site’s value. All application texts and materials were completed and presented to UNESCO by February 2017. In July, Hoh Xil together with Kulangsu Island in Southern China, were listed as new World Natural Heritage and Cultural Heritage sites respectively, taking the number of World Heritage sites in China up to 52. Yet certain challenges for the future preservation of Hoh Xil remain. “Generally speaking, the overall management of the 52 World Heritage sites has improved after their listing. But one big challenge is the temptation for local governments to develop tourism,” Dr Zhu Chunquan, country representative from IUCN China told NewsChina during a recent interview. Jiuzhaigou, listed as a World Natural Heritage site in 1992, began to experience a tourism boom that has continued to this day. “As a bad example, Jiuzhaigou is definitely overdeveloped as a tourist destination, and this has impacted upon the biodiversity inside the domain,” Zhu told the reporter, adding that pandas once roamed inside Jiuzhaigou but have all been scared away by the influx of huge numbers of people, and this indicated a failure of the preservation efforts of the site after its nomination. In addition, according to Zhu, all indigenous Tibetan communities inside Jiuzhaigou were relocated and offered jobs in the 1990s. “The natural domain, however, should not lose its cultural connotations,” said Zhu, “tourism in a sustainable way without destroying both the natural and cultural value of the heritage site is a real challenge.” Statistics from the Hoh Xil Administration indicate that as more and more tourists drive their own cars to visit Qinghai and Tibet, the number of visitors to Hoh Xil has risen to up to 40,000 last year. The number will increase in the foreseeable future, admitted Bu Zhou. Hoh Xil boasts the largest calving ground of the Tibetan antelope and its major habitat area. Each summer, some 30,000 female antelope migrate to the basins of Zunai and Taiyang Lakes inside Hoh Xil to deliver their calves. During the winter, some 40,000 Tibetan antelope remain in the nominated property, accounting for 20 to 40 percent of the global population. So far climate change and the construction of roads are the major threats to Hoh Xil’s environment. The effects of climate change have led to the melting of glaciers, snow and permafrost in the region. This, coupled with the rise in precipitation, have increased the water volume and already turned some pastureland into lakes and wetlands. 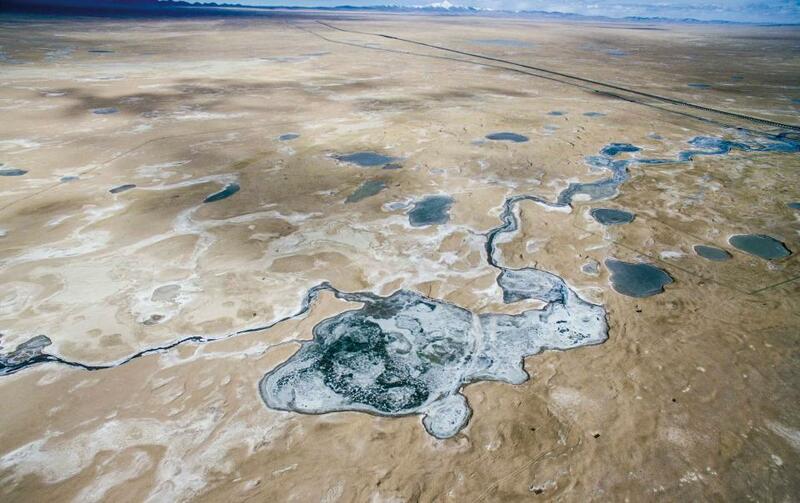 Xie Changwei from the Cryosphere Research Station on the Qinghai-Tibet Plateau, under the Chinese Academy of Social Sciences, told The Paper in late August that the overall area of Salty Lake, to the east of Zunai Lake, has expanded from an area of 45 square kilometers to 156 square kilometers in 2011 through 2017. 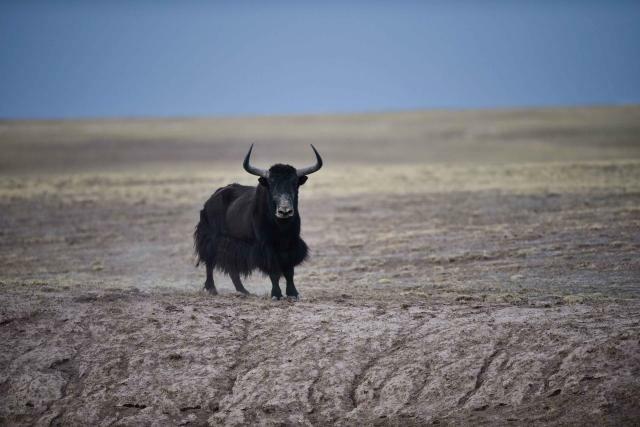 “If the overflowing water situation continues, habitats for Tibetan antelope and yaks could shrink in the summer,” Bu Zhou explained. The Qinghai-Tibet Road and Railway, which both cross Hoh Xil, connect the nature reserve with the outside world. However, the IUCN assessment points out that the two arteries, while bringing convenience to locals, are among the biggest threats to local wildlife. Lian Xinming, an associate professor from NWIPB has focused his study for many years on the impact of the construction of the road and railway upon the migration of the Tibetan antelope, and on solutions to minimize the impact. According to his findings, the 33 corridors built under the railway to allow the Tibetan antelope to pass beneath where the line crosses their habitat are rarely used by the animals when they migrate. Yet the Wubei Bridge of the Hoh Xil section of the Qinghai-Tibet Railway, along the bed of a former river, is the route the antelope prefer to take during the migration season. “The reason, I found out, after years of research, is that the Tibetan antelope are afraid of the traffic they see on the road. When they pass through under Wubei Bridge, they cannot see any traffic due to the horizon being blocked by some small hills,” Lian said, and added that proper locations for creating corridors are not easy to determine without sufficient study of the surrounding topography and animal habits. According to an inside source, as a national strategic plan, this highway project has been decided for years and is expected to go into construction soon. “To build the highway in between the existing two is to minimize the impact on the corridor and habitat of the wildlife,” the source added. 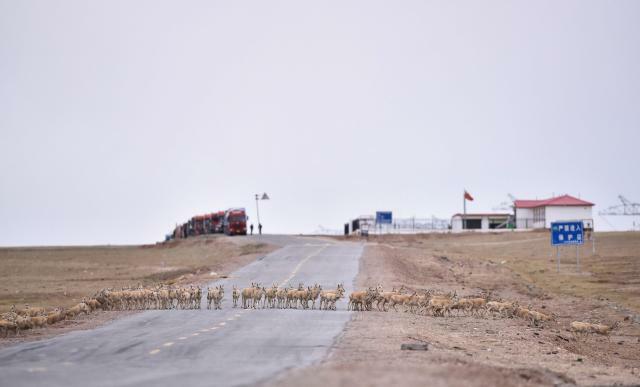 “The impact is unavoidable, since the planned highway is too wide and I doubt the Tibetan antelope would dare pass under it,” Bu Zhou told the reporter.